“Waiting On” Wednesday is a weekly event, hosted by Jill @ Breaking the Spine, that spotlights upcoming releases that we’re eagerly anticipating. Life is almost back to normal for Harper Price. The Ephors have been silent after their deadly attack at Cotillion months ago, and best friend Bee has returned after a mysterious disappearance. Now Harper can return her focus to the important things in life: school, canoodling with David, her nemesis-turned-ward-slash-boyfie, and even competing in the Miss Pine Grove pageant. Unfortunately, supernatural chores are never done. The Ephors have decided they’d rather train David than kill him. The catch: Harper has to come along for the ride, but she can’t stay David’s Paladin unless she undergoes an ancient trial that will either kill her… or connect her to David for life. 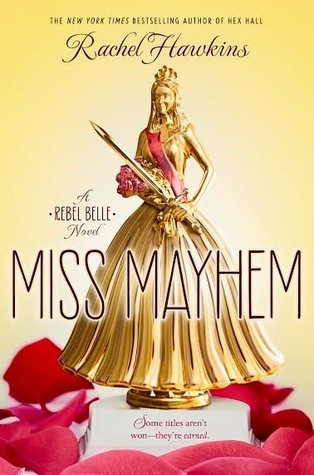 I read and enjoyed Rebel Belle. It was fun and entertaining. In fact I’m getting ready for a re-read. I’ve been waiting for Miss Mayhem for almost an year now. Hopefully this one’ll be good too.